M. Osborn, Der Maler Christian Schad, Berlin, 1927. W. Schmied, Neue Sachlichkeit und Magischer Realismus in Deutschland, 1918 -1933, Hanover, 1969. R. Hiepe, 'Zu den neusachlichen Bildern des Malers Christian Schad', in Die Kunst und das Schöne Heim, Munich, 1972 (illustrated p. 723). P. Liska, Die Malerei der Neuen Sachlichkeit in Deutschland, Osnabruck, 1976. H. Sterk, Eine Schau über Kunst zwischen den Kriegen, Neue Zeit, Graz, 1977. Wochenpresse, Vienna, 13 April 1977. A. Heesemann-Wilson, Christian Schad, Expressionist, Dadaist und Maler der Neuen Sachlichkeit, Leben und Werk bis 1945, Gottingen, 1978. W. Schmied, 'Neue Sachlichkeit und der deutsche Realismus der zwanziger Jahre', in Die Kunst und das schöne Heim, Munich, 1978. G.A. Richter, Christian Schad, 1894-1982, Rottach-Eggern, 2002, p. 106 (illustrated p. 107). Exh. cat., Glitter and Doom, German Portraits from the 1920s, The Metropolitan Museum of Art, New York, 2006 (illustrated p. 28, fig. 9). 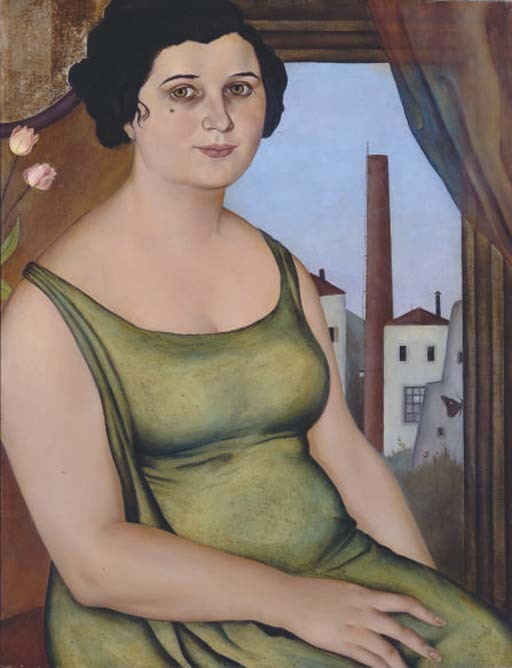 Vienna, Galerie Würthle, Christian Schad, 1927. Dusseldorf, Deutsche Kunst Düsseldorf 1928, 1928. Hamburg, Galerie Brockstedt, Christian Schad, Gesichter der zwanziger Jahre, 1964. Dusseldorf, Galerie Nebelung, Bilder der zwanziger Jahre, 1965. Wuppertal, Kunst- und Museumsverein, Magischer Realismus in Deutschland 1920-1933, 1967. Milan, Galleria del Levante, Christian Schad, February 1970, no. 27 (illustrated); this exhibition later travelled to Munich, Galleria del Levante. Modena, Galleria Mutina, Schad dipinti dal 1920 al 1930, 1970. Milano, Palazzo Reale, Christian Schad, 1972 (illustrated). Bologna, Galleria d'Arte Stivani, Christian Schad, 1973. Vienna, Museum des 20. Jahrhunderts, Christian Schad, 1977. London, Royal Academy, Cityscape 1910-1939, Urban Themes in American, German & British Art, 1977-1978, no. 123. London, Hayward Galleries, Neue Sachlichkeit and German Realism of the Twenties, 1978. Berlin, Staatliche Kunsthalle, Christian Schad, Juni - August 1980, no. 73 (illustrated p. 95). Rome, Galleria Netta Vespignani, Promemoria, 1989. Milan, Palazzo della Permanente, Nuova Oggettività, Germania e Italia, 1920 - 1939, Omaggio a Emilio Bertonati, 1995, February - March 1995 (illustrated p. 76). Zurich, Kunsthaus, Christian Schad, 1894 -1982, August - November 1997, p. 100, no. 14 (illustrated p. 101); this exhibition later travelled to Munich, Städtische Galerie im Lenbachhaus, November 1997 - February 1998 and to Emden, Kunsthalle, February - April 1998. Vignola, Rocca di Vignola, L'Eroe Borghese, Temi e figure da Schiele a Warhol, April - July 2000, no. 41 (illustrated p. 101). Munich, Kunsthalle der Hypo-Kulturstiftung, Der kühle Blick, Realismus der zwanziger Jahre in Europa und Amerika, June - September 2001 (illustrated p. 289). Paris, Fondation Dina Vierny - Musée Maillol, Christian Schad, November 2002 - February 2003 (illustrated p. 91). New York, Neue Galerie, Christian Schad, March - June 2003, p. 249 (illustrated p. 127). Milan, Compagnia del Disegno, Nuova oggettività, Neue Sachlichkeit, January - April 2005 (illustrated p. 58). Frau aus Pozzuoli (Woman from Pozzuoli) was painted in 1925. It was begun in Naples before Schad moved to Vienna in the summer, and completed in the Austrian capital shortly after the artist moved into a splendid new studio in the Habsburgerstrasse 1, by the Graben, towards the end of the year. Depicting a proletarian factory worker from the Neapolitan industrial suburb of Pozzuoli, this sharply observed and objective portrait of contemporary contrasts marks the final transition of Schad's Italian-born style into the slick, obsessive and precisely rendered 'Neue Sachlichkeit' that distinguished his work in Vienna and Berlin. But, although Rome proved influential, it was Naples that determined the direction in which his art developed. It was there that Schad settled and it was there that the foundations of his cold, surgically precise and almost hyper-real style of objective realism were laid. Developing a unique technique based on the subtle glazing of the old-masters, in which a gradual build-up of near transparent layers of paint lends the surface a vibrant luminosity, Schad originated in Naples a cool, sharp, incisive and seemingly brushless style of portraiture that is now widely regarded as the epitome of the Neue Sachlichkeit. In particular, Schad recalled, it was the fiery city atmosphere of Naples, where he decided to live and which, throughout his life, he would never forget, that brought home to him how sharpness and clarity of image could be used in a revelatory way to suggest an almost magic reality. 'Nothing was cut and dried there,' he said, 'things could emerge out of the multifarious and twilight sides of life at any time. Every day the strangest things happen, which might, depending on one's views, be taken as diabolical, magical or fateful.' It was, he recalled in his memoirs, this 'volcanic temperament' in the Neapolitan atmosphere that caused him to focus intently on 'the here-and-now, instead of the hereafter,' and, paradoxically perhaps, to 'bestow sharper outlines on every-day life in all its various manifestations' (Christian Schad, Relative Realitäten, Erinnerungen an Walther Serner, Augsburg, 1999, p. 72). It is precisely these qualities that are embodied in Frau aus Pozzuoli. The composition is, in many respects, a classical one - a seated figure in front of a window looking out onto a landscape. With the introduction of an exterior view through the window and in particular with the form of the window's frame echoing that of a picture frame, this picture-within-a-picture immediately suggests a disparity and the possibility of multiple realities existing within the same picture. A Neapolitan woman, healthy, romantic, depicted as passionate, fills the picture space by seeming almost confined in a small interior that is directly contrasted with the grey empty industrial landscape of Pozzuoli and the factory behind her. This harsh pictorial juxtaposition between sitter and background is a playful pictorial device that Schad would develop with increasing frequency over the next few years, presenting his sitters set against dramatic and often emblematic vistas of modern life. It is a device that both fulfills a narrative function and at the same time questions the apparent realism of the picture. Enhanced by the illusionism of his fastidious painterly style, this simultaneous presentation of twin, but contrasting views illuminated by the same light and delineated with equal clarity and precision, has the effect of undermining the apparent trustworthiness of the image as a whole. Seducing the eye, it asserts a pictorial reality all of its own, while also revealing objective photographic realism, and, by implication, our conventional perception of reality itself, to be an artifice, a thin cinematic-like surface - an illusory web of fascinating and for Schad, often symbolic, detail. This playful game of perception is augmented at the top of the painting where a mirror and a veil are shown appended to each corner. Seated in front of the window/picture, the unknown Italian woman in this painting seems almost posed before a portrait detailing the grey emptiness of her daily life. This approach towards social commentary is one typical of much Neue Sachlichkeit work and, to some extent the Italian novecento movement, but it is a rare move for Schad. The poignancy of this contrast is further enhanced by a few natural symbols, which, typically for Schad, are placed with prominence and precision within the picture. Two flowers beneath the mirror at the top left of the painting clearly hint at the romantic nature of the sitter and/or her longing for love, while the butterfly climbing the window frame seems also to symbolise her romantic leaning. Shown walking along the edge of the window frame in front of the depressingly empty and barren landscape with its grey colours and factory chimney, the contrast between it and its background seems representative of this Neapolitan woman's situation as a whole. Schad often recalled the passion and 'volcanic temperament' he had witnessed in the Neapolitans and it is this aspect of Neapolitan life thrown into direct opposition with the seemingly bland conformity required by modern industrialised living that is depicted in this work. Something of the slight look of sadness and appeal in the woman's face seems to confirm this. In the catalogue notes to this painting which Schad helped to prepare for the retrospective of his work in Berlin in 1980, it is suggested that when the artist was completing this painting in Vienna, he began to bestow this unknown woman from Pozzuoli with the features of his wife Marcella. The prettiness of the woman's eyes and the sharp assuredness in the way in which her features have been rendered all recall Schad's portraits of Marcella and this has led some commentators to confuse this work as being a portrait of Schad's beautiful but 'eccentric wife'. Schad was to paint an important portrait Marcella in the year that followed this painting, depicting her seated in front of a balcony looking out onto the backstreets of Montmartre, and both these paintings were evidently of some importance to Schad. A 1926 photograph of his illustrious studio in Vienna shows Frau aus Pozzuoli proudly displayed on the easel and along with the1926 portrait of Marcella, the painting was chosen by the artist for his first major solo exhibition at the Kuntshandlung Würthle in Vienna in 1927.